The following photos by Romain de Jaeger show just how wonderful birdwatching and wildlife photography can be in Laguna de Apoyo Nature Reserve. Here are photos of some of the more common birds seen by birders in the area. 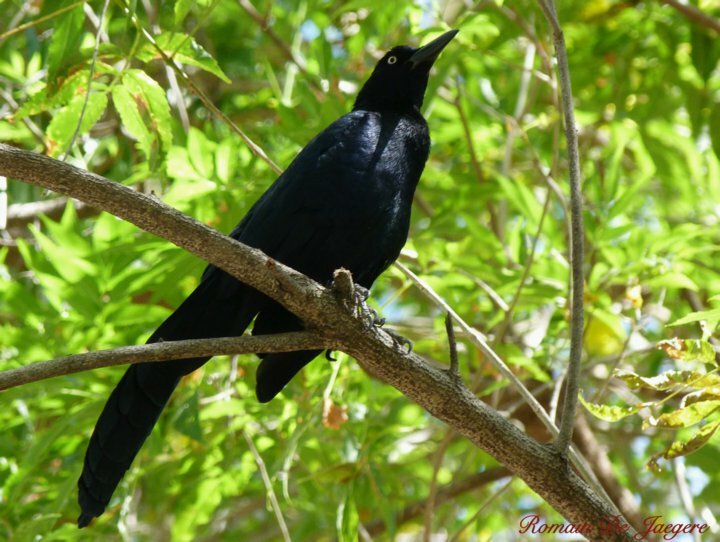 Of Nicaraguan birdwatching locations, Laguna de Apoyo Nature Reserve is among the more accessible and productive. Nature photography at its finest! The Northern Oriole (Icterus galbula) is also known as the Baltimore Oriole; the adult male (shown above) is nothing short of spectacular, with a bright orange contrasting with black and white. 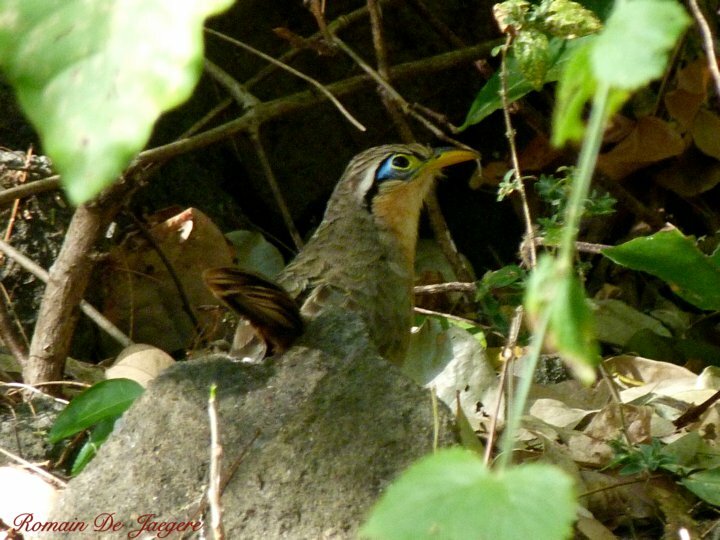 Males, females and juveniles can be seen in flocks of up to twenty-five conspecifics, between September and early April, when they are winter residents of the tropical dry forest of western Nicaragua. They indulge in sweet fruits and nectar of flowers. 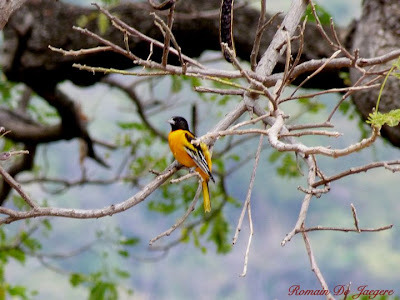 A flowering macuelizo (Tabebuia rosea), for instance, almost guarantees numerous orioles nearby; in fact, there may be an important association between the two, as the winter range of the bird is very close to the native range of the tree. 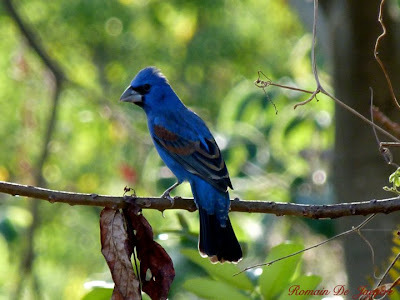 All members of this species in Nicaragua migrate northward in April and May to nest. In contrast to the Northern Oriole, Blue Grosbeaks (Passerina caerulea) are present year-round. A pair nested very close to Estacion Biologica this year. During the dry season, they visit our water tower, to drink from water which spills from it when it is filled. In addition, we likely receive migratory birds, which are known to winter as far south as Costa Rica. Is the pictured bird resident or migratory? Who knows! 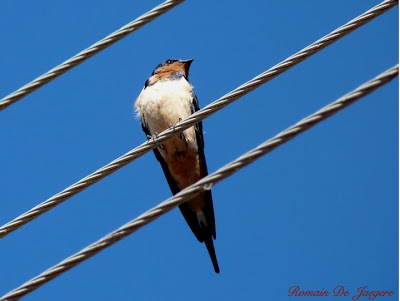 The Barn Swallow (Hirundo rustica) winters in great numbers in Nicaragua, along with other swallows. 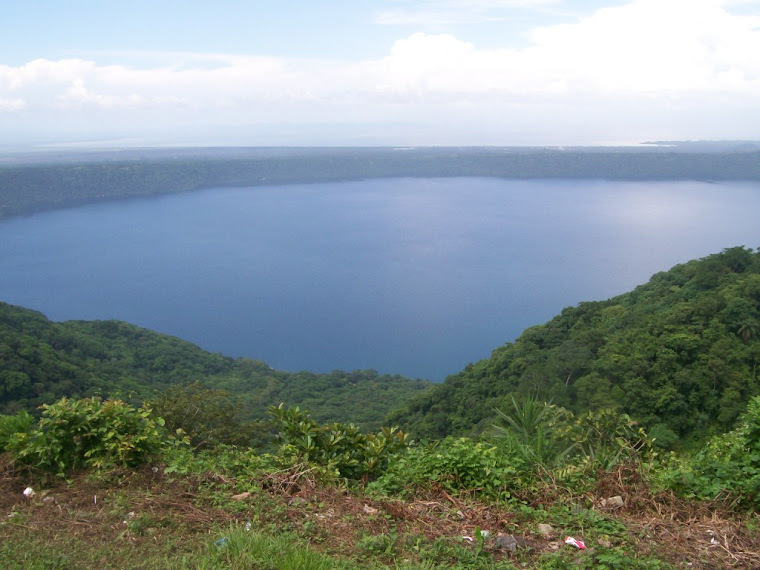 Their center of abundance is in the cattle farms of Rivas, but many can be seen in Laguna de Apoyo Nature Reserve, too, especially from the edge of the crater, in Catarina. This bird tends to congregate in open areas with few trees, but it will fly in flocks over forest canopy as well. The Barn Swallow is the most widespread of the swallows, with populations on all human-populated continents. 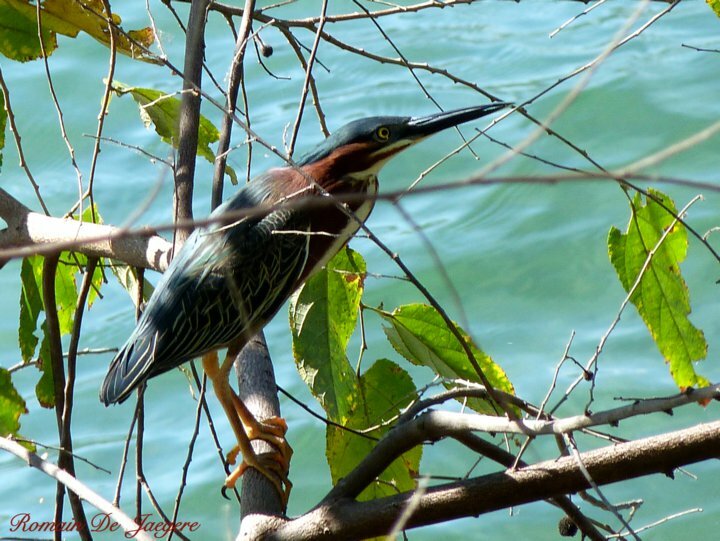 The Green Heron (Butorides virescens) is a common resident in Nicaragua and a few are found on Lake Apoyo. This species was recently split from another, also recently documented in Nicaragua but much less common (Butorides striatus). Migratory Green Herons may also be found in our area, although no specific information regarding the populations in our area exists. The most common passerine bird in Nicaragua is the Great-tailed Grackle (Quiscalus mexicanus). This noisy, boisterous bird can be found in almost any urban area or human-altered environment, or along rivers and lake shores. Although common, they are majestic, as is seen in the photo of this male. Nonetheless, they are not forest birds. We do not find them in our monitoring activities in deep forest. Rarely seen but often heard in Laguna de Apoyo Nature Reserve is the Lesser Ground-Cuckoo (Morococcyx erythropygus). This resident bird utilizes tall grass in open areas and secondary growth, rarely reaching even two meters above the ground. It produces a shrill, monotone whistle, reminiscent of a police whistle. Locals call it the clock bird (pajaro reloj), and suggest it may call on hourly intervals. The blue, featherless sere around the eye gives the bird a unique appearance. 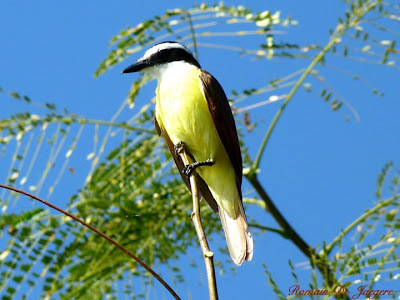 Another very common Nicaraguan bird is the Great Kiskadee (Pitangus sulphuratus), also a member of perhaps the most common of all families, the tyrant flycatchers, Tyrannidae. Almost all the tyrant flycatchers are expert predators of insects on the wing, and they have bristles along the gape of their mouths to help guide prey toward their mouths. This species is active and loud throughout the day, allowing ample opportunities for viewing among neophyte birders. It is a year-round resident. 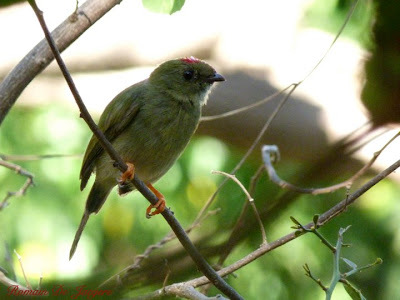 The Long-tailed Manakin (Chiroxiphia linearis) is, perhaps, the prettiest of all birds in the tropical dry forest habitat of Lake Apoyo Nature Reserve. At least regarding the adult males, which are nothing short of specatular. This female, however, is far more subtle, with a drab green background. The bright orange legs of male, female and immature alike, however, facilitate species identification in dark areas under canopy, where they stay. They tend to pluck small fruits in flight, and eat them after perching again. This resident bird is the most common of the birds we encountered by mist netting, although we see far fewer when birdwatching. Would you like to go birdwatching with us? Estacion Biologica can arrange a bird conservation professional to take you on a birdwatching excursion. Please contact us to make a reservation.